Tightly packed rosettes of small green fleshy leaves, often with a strong reddish flush. The rosettes are covered with fine white hairs giving its distinctive cobweb appearance. Produces many offsets, creating the typical small mound of rosettes. Pink flowers on rising stems. 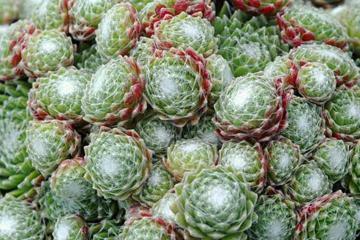 Like all houseleeks, tends to be rather variable, resulting in a number of named varieties. All house leeks thrive best in full sun and on poor, sharply drained soils. Very drought tolerant and will survive in positions where not much else will grow. Will root into very small crevices, but may need to be secured until established. Alpine gardens, sinks and other containers. Will readily establish on walls , rock faces or on house rooftops, which results in its common name.